Choose your own adventure from the wide range of attractions in the Okanagan Valley. Make it a leisurely visit by sampling wines at some of the 170 wineries and playing golf at the 50 courses on offer in the region. Seek out the valley’s extreme activities: Hike around the highest peak in the Canadian Rockies, see a massive waterfall and descend deep into an old gold mine. Originally settled as gold mining territory, the Okanagan Valley has developed into British Columbia’s largest wine-growing region and a highly popular tourist area. At the center is Kelowna, the valley’s largest city. Stay here for easy access to the rest of the valley and to enjoy the town’s beautiful Lake Okanaga shoreline. Fish, kayak or swim in the lake’s warm waters. Learn the history of the region’s wine-growing industry at the BC Wine Museum in Kelowna. Visit during the evening on the first Thursday of each month for a free tasting of regional wines. Head to Princeton in the southwest part of the valley to see the Mascot Gold Mine and learn about the industry that once ruled the area. Climb up into the mountains, descend a heritage walkway and go deep into the old mine. Explore the northeast end of the valley to find its most picturesque natural areas. Wells Gray Provincial Park sits among the Cariboo Mountains. Hike the region’s trails to find a volcanic cave or see the majestic Helmcken Falls cascading 463 feet (141 meters). Head farther into the mountains to Mount Robson Provincial Park, centered on the highest peak in the Canadian Rockies, Mount Robson. Take the popular Berg Lake Trail to cross paths with Berg Glacier. Reach the Okanagan Valley by driving 4 hours inland from Vancouver. You can also fly into the Kelowna airport from Vancouver and Seattle. Once there, get around easily by car or make use of the bike paths that traverse the valley and the surrounding hills. Explore miles of trails that wind through stunning sub-alpine forest and look for wildlife and historical monuments in this expansive park. Sip the region’s finest wines and cast your eye across superb views of the Okanagan Valley at this award-winning winery. You’ll find native wildlife, exotic plants, calm waters for swimming and a regular program of events at this city-center park. These tranquil Japanese gardens, complete with koi ponds and a tea house, provide the ideal place to escape the bustle of the city. Miles of walking trails, untouched cultural sites and forest groves are set among the stunning landscape of this beautiful park. 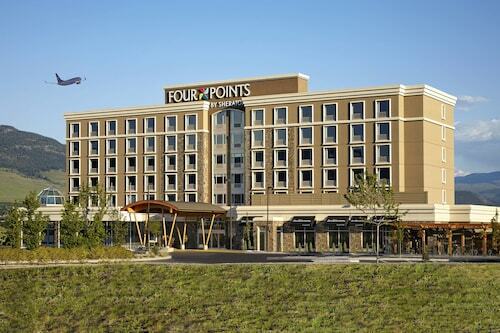 Located in Central Okanagan, this eco-friendly hotel is within 1 mi (2 km) of Capri Mall, Kasugai Gardens, and City Park. BC Wine Museum and VQA Wine Shop and Prospera Place are also within 2 mi (3 km). 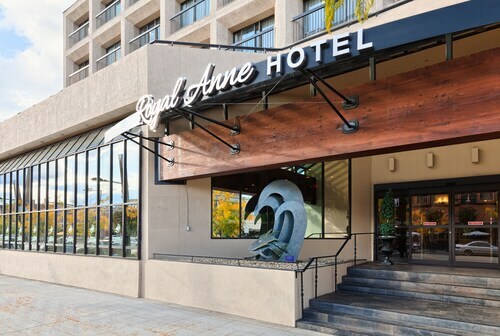 Located in Central Okanagan, this resort is steps from Kelowna Art Gallery and Prospera Place. Kelowna General Hospital is 1.4 mi (2.2 km) away. 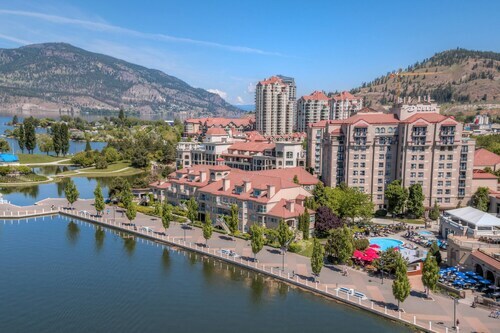 This family-friendly Osoyoos resort is located on a lake, within a 5-minute walk of Nk'Mip Desert Cultural Centre and Sonora Dunes Golf Club. Rattlesnake Canyon and Pioneer Walkway are also within 2 mi (3 km). This family-friendly Kelowna hotel is located in Central Okanagan, within 1 mi (2 km) of Mission Creek Regional Park and Orchard Park Mall. Capri Mall and Mission Creek Golf Club are also within 3 mi (5 km). 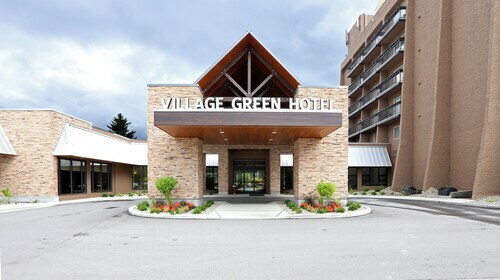 Located in North Okanagan D, this hotel is 0.1 mi (0.1 km) from Village Green Centre and within 3 mi (5 km) of Planet Bee Honey Farm and Davison Orchards Country Village. Allan Brooks Nature Centre and Predator Ridge Golf Resort are also within 12 mi (20 km). 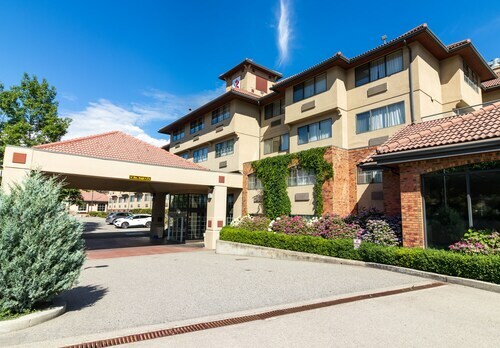 Located in Downtown Kelowna, this hotel is within a 15-minute walk of Kasugai Gardens and Prospera Place. Kelowna General Hospital is 1 mi (1.6 km) away. Edmonton Intl. - Kelowna Intl.